I recently finished this this small wall hanging piece. I’ve titled it, “Into The Mist”. I used an old scrap of some random Japanese import fabric that I’ve loved and had in my stash for years but could never find the right place for, and a couple of Kona solids, along with my favorite- an assortment of linens. 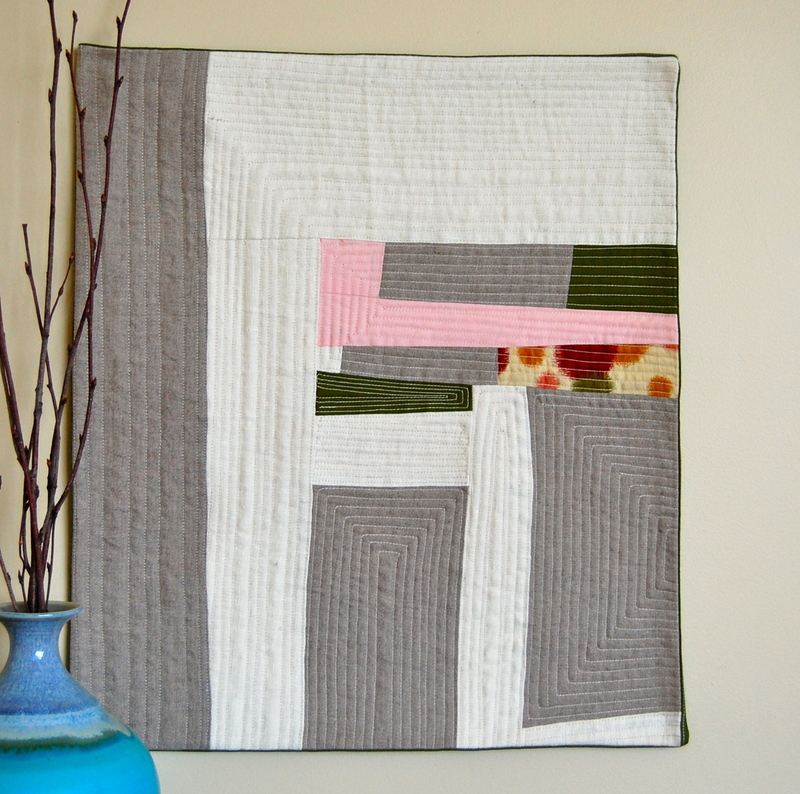 I love the feel and look of linen, and in this piece I used two different colors and weaves. I think they are perfect for improv designs because of their….ahhh, “flexibility”. 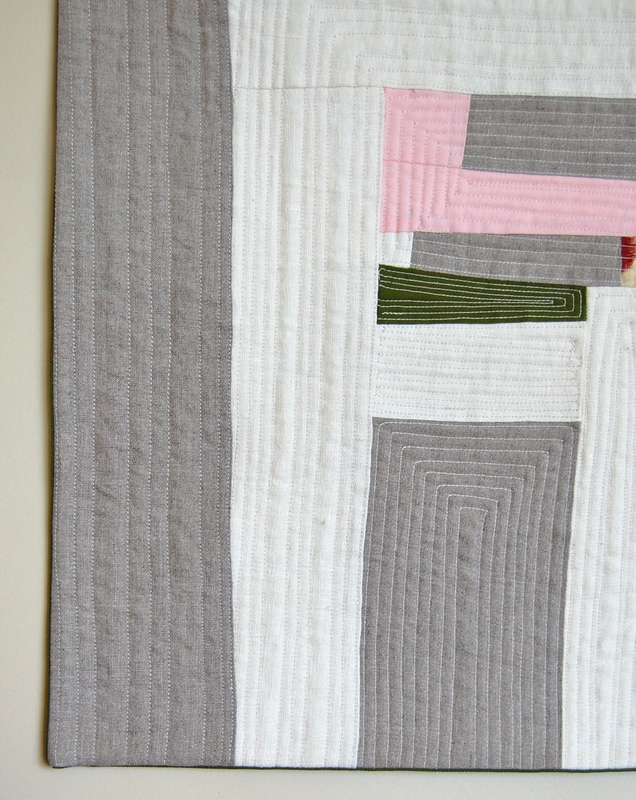 You can just let them go where they want to and it becomes part of the design as opposed to trying to make them fit into a design that requires matching points (like the with this frustrating quilting experiment). The binding on this piece was an experiement of sorts. I used this tutorial– quite loosely- and found it helpful. I need a bit more practice with the method but for a first attempt, I’m happy with it. I am still playing with different methods of finishing small wall hanging pieces like this. I linked this post up with some amazing modern finishes over at Canoe Ridge Creations- Sew Modern Monday. Go on over and have a look if you have a spare moment or two!! I LOVE this Karen. I think it’s my favorite so far. So simple and complex at the same time. My favorite so far too. Harks back to cubism (Braque and Picasso), and sixties painters like Barnett Newman (who was influenced by quilts). Your really hitting your stride now. Keep going! You’re on a roll. It’s wonderful!! Love the design, fabric combination and the quilting is superb!! ohh, i love it!! so beautiful and i bet, satisfying! this is so lovely. you are right about using linen for this tye of project. I’ve been sitting on some gorgeous linen for sometime and been afraid to use it. I think i’ll try something like this. 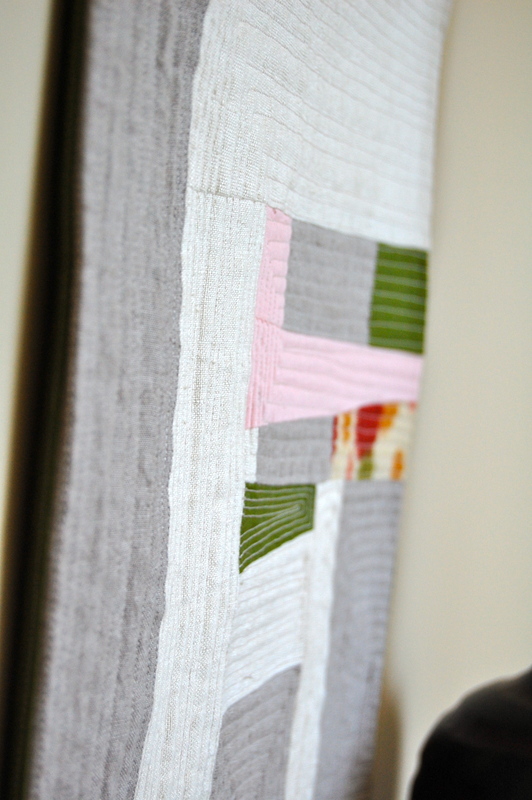 The quilting is beautiful and that binding looks great! I love this! 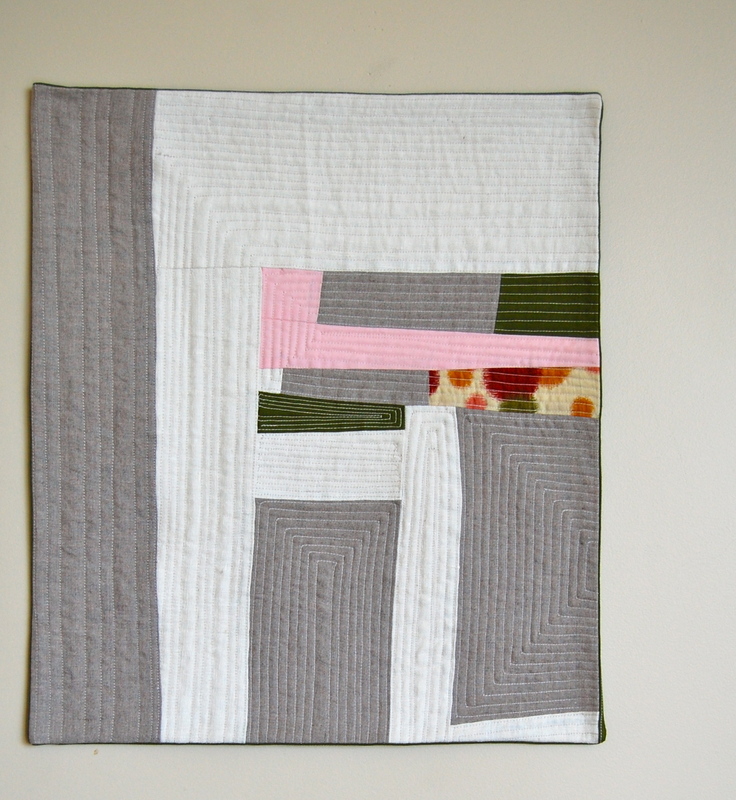 I’ve wanted to try using the same tutorial to bind a wall quilt. I’ll have to give it a try sometime. Just got home so just got your blog. 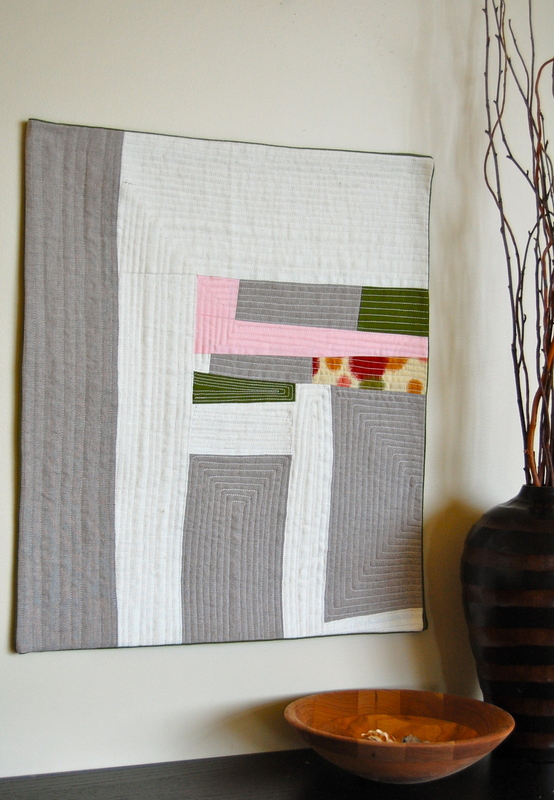 So incredibly amazing-I absolutely love this quilt–your imagination knows no boundaries. Can’t wait to see what you do next. So lovely! It is beautiful piece of art on your wall! This is a beautiful quilt. I am thinking about trying my hand at the more modern…not sure I will be able to break out of the traditional! Hope so…Thanks for the inspiration.